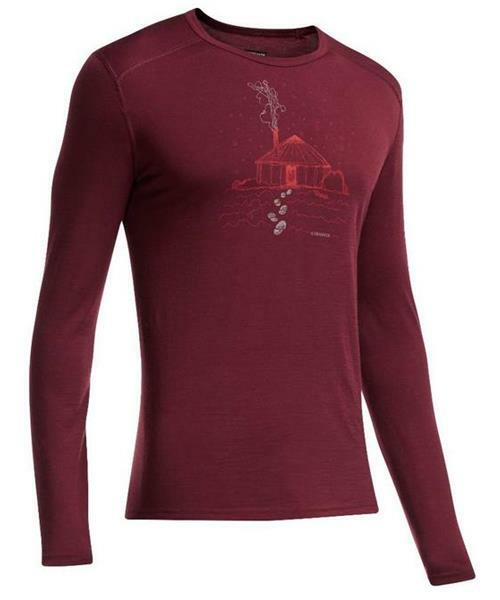 A reliable classic for year-round versatility and breathable comfort, the Oasis Long Sleeve Crewe Yurt is a lightweight baselayer top primed and ready for everything from international backpacking adventures to weekend powder turns. Featuring Icebreaker's lightweight 200gm BodyFit fabric made from 100% merino wool, the Oasis Long Sleeve Crewe provides easy layering, high breathability and natural odor resistance. Offset shoulder seams and flatlock stitching reduce friction with or without a backpack on. Original artwork by Bill Carlen-Horton evokes the winter warmth that this soft merino layer provides.